Sen. Lindsey Graham (R., S.C.) on Wednesday released a statement criticizing President Donald Trump's decision to withdraw troops from Syria, calling it an "Obama-like mistake." The Wall Street Journal and Reuters, followed by others, reported on Wednesday that Trump planned to "immediately" remove U.S. troops from northern Syria. Trump appeared to confirm these reports on Twitter by saying that the United States "defeated" the Islamic State in Syria. Graham, who serves on the Senate Armed Services Committee, went on to say that the withdrawal "would be a big win" for ISIS, Iran, Syrian President Bashar Assad and Russia. "I fear it will lead to devastating consequences for our nation, the region, and throughout the world. 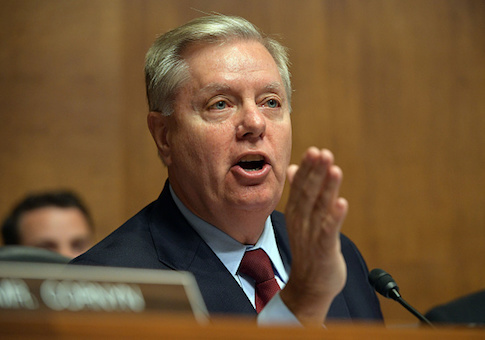 … Staying there is an insurance policy against the reemergence of ISIS and destruction of our Kurdish allies who fought so bravely against them," Graham added. Graham referred to his visit to Syria earlier this year and said the 2,000 American troops stationed there are "vital to our national security interests." "An American withdrawal will put the Kurds and all those who came to America’s aid in destroying ISIS at tremendous risk," Graham said. "It will make it more difficult to recruit future partners willing to confront radical Islam. It will also be seen by Iran and other bad actors as a sign of American weakness in the efforts to contain Iranian expansion." Graham wasn't the only Republican lawmaker to criticize Trump's decision to withdraw troops. Sen. Marco Rubio (R., Fla.) called it a "grave error," and Rep. Adam Kinzinger (R., Ill.) said Trump's tweet about ISIS being defeated is "simply not true." Sen. Cory Gardner (R., Colo.) was also critical of Trump's plan, urging him to "immediately halt any plans to withdraw US troops from Syria and to consult with Congress on a long-term Syria strategy." This entry was posted in National Security and tagged Barack Obama, Bashar al-Assad, Donald Trump, Russia, Syria. Bookmark the permalink.